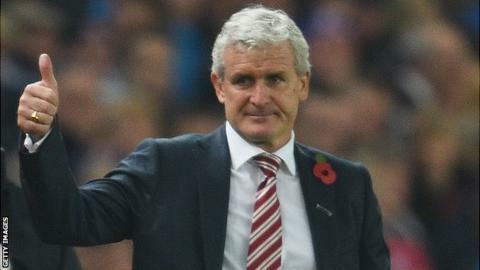 Stoke City boss Mark Hughes wants reaching cup semi-finals to become "the norm" for the Premier League club. The Potters reached the last four of the League Cup for the first time since 1972, the year they won the trophy, by beating Sheffield Wednesday. "We're striving to get to the latter stages of cup competitions - that's the aim," Hughes told BBC Radio Stoke. "It's been a long time - but we hope that's going to be the norm in the future." The Potters, FA Cup finalists in 2011, will now face either Manchester City, Everton, or Southampton or Liverpool - who meet in the last quarter-final on Wednesday - for a place at Wembley. And 52-year-old Hughes is unconcerned about who they will face. "I'd back us against anyone at the moment over two legs, so let's see how far we can go," the Welshman said. "It shows the quality of the competition and the so-called bigger clubs will start taking it more seriously. "We're very much in the mix and whoever gets us will understand it'll be difficult for them to get to the final." Hughes made five changes for the game with the Owls, resting Xherdan Shaqiri and Bojan, while another summer signing - Ibrahim Afellay - scored his first goal for the club. And the Stoke boss is encouraged by the competition he has within his squad. "I've got a really strong group of players and it was important we give key players a bit of a break to keep them fresh," he added. "I've got people knocking on my door every day because they want to play, but I'm honest with them and they understand what we're trying to do."